In the previous post, I’ve covered Docker CI, and talked about Continuous Deployment and Continuous Delivery. This time, I’m going to share our POV for building effective CD (both CD types) for a microservice based application, running on a Kubernetes cluster. After CI completes, you just have a new build artifact – a Docker image file. Now, somehow you need to deploy it to the desired environment (Kubernetes cluster) and maybe also need to modify other Kubernetes resources, like configurations, secrets, volumes, policies, and others. Or maybe you do not have a “pure” microservice architecture and some of your services still have some kind of inter-dependency and have to be released together. I know, this is not “by the book”, but this is a very common use case: people are not perfect and not all architectures out there are perfect either. Usually, you start from an already existing project and try to move it to a new ideal architecture step by step. So, on one side, you have one or more freshly backed Docker images. On the other side, there are one or more environments where you want to deploy these images with related configuration changes. And most likely, you would like to reduce required manual effort to the bare minimum or dismiss it completely, if possible. Continuous Delivery is the next step we are taking. After CD completes, we have a new artifact – an updated Helm chart package (tar archive) of our Kubernetes application with a new version number. Helm chart repository is not a real server that aware of deployed charts. It is possible to use any Web server that can serve static files as a Helm chart repository. In general, I like simplicity, but sometimes it leads to naive design and lack of basic functionality. With Helm chart repository it is the case. Are you saying injecting all env specific values into the packaged chart ? How do you reuse the same snapshot across distinct environments ? Default values are in chart. But we override most value and decrypt secret values per environment (production, staging, testing) when deploying a chart. It’s indeed a headache to maintain a set of variables per environment. For example, adding a new variable requires to add it to each environment. We are working to simplify management of multiple variable files, environments, and secrets. Would you reuse helm charts in flavor to reuse it? I had seen many projects with tens of similar services. Would you consider the idea of rule similar kind of services from the same chart? In a situation where you have many services that are all the deployed the same way, you can potentially have “one chart to rule them all”, where you are simply passing in different Docker image refs every time you deploy. However, with the approach described above, it becomes difficult to see what’s really running in your cluster using a “helm list” (all chart names are the same). We are starting to go down the K8s and Helm path and these articles have been very helpful. 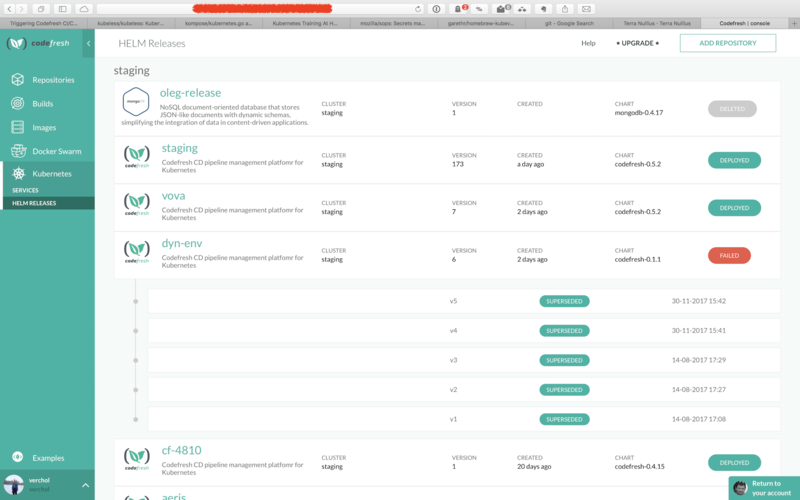 I am working on planning our CD pipeline and a challenge I am still facing is how to deal with SymVer for Helm Charts while doing Continuous Delivery. In my research on the Internet I see many folks mention that SymVer has to be handled manually, as part of the code commit. This makes it difficult for many developers working on the same codebase and to use CD. I was curious if you had any advice for dealing with SymVer with something like you Kubernetes Continuous Deployment scenario you outline above? Any considerations when your Helm Chart includes multiple containers each that are versioned independently.